At the end of last week regional newspaper publisher Archant set live its new look Eastern Daily Press site – part of changes ahead of a larger redesign later this year. Here’s a snapshot of part of the home page, which now features a wider layout and simpler navigation. The design follows that already seen on the revamped East Anglian Daily Press and Evening Star titles, which will be rolled out group-wide. 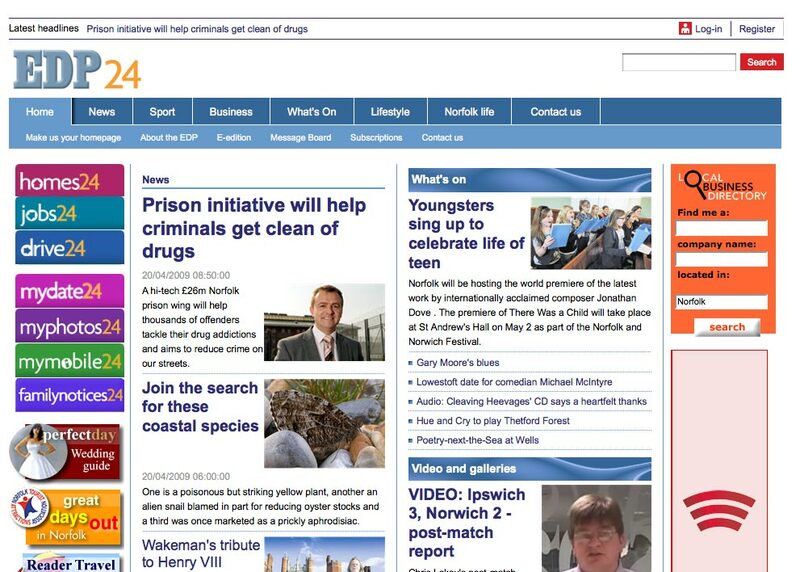 “The EDP is Archant’s most popular newspaper website (around 2.5m page views, and 280k monthly unique visitors), and is a regular award-winner. The changes made this week are to intended to give the site a more modern approach (…) and represent the first major redesign since the site was launched in 2001,” James Goffin, Archant regional web producer, told Journalism.co.uk. “We’ve also reviewed the content on the site to make sure it is fully in tune with what our readers are looking for. Congratulations to Archant’s Norfolk web team (Celia Sutton, Tracey Tutt and Vince Yallop) for the EDP overhaull – am sure they’d appreciate any thoughts? This entry was posted in Newspapers and tagged Archant, Archant's Eastern Daily Press, Celia Sutton, content management system, East Anglian Daily Press, Eastern Daily Press, Evening Star, James Goffin, Journalism.co.uk, last week regional newspaper publisher, regional web producer, Tracey Tutt, Vince Yallop, web producer, web team on April 20, 2009 by Laura Oliver.